Easily turn on the lights with your voice. Perfect for those early mornings, or whenever your hands are full. 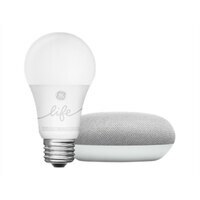 Google Smart Light Starter Kit - Smart speaker - Bluetooth, Wi-Fi - white, chalk grayEasily turn on the lights with your voice. Perfect for those early mornings, or whenever your hands are full.